Hi everyone. Last week I posted these cards using the same stencil, layout and design, but using just Black Brushos for the background. These are so many pigments within each colour. Today is just Light Brown Brushos. So happy with how they turned out. And I'm linking up to Simon Says Wednesday - Anything Goes. Edited to add: Thanks to Linby, I'm linking up to Mo's May Rudolph Days Challenge. Love this!....Loll, is mixed media paper the paper that you have found you liked the best? I love this stencil! Look at you getting the jump on all those Christmas cards, Loll! Such a stunning effect with the Brushos. Just as lovely as the one with the black brushos! It's a great design! Loll, I agree with Vicki!! These are amazing!! Wonderful card! 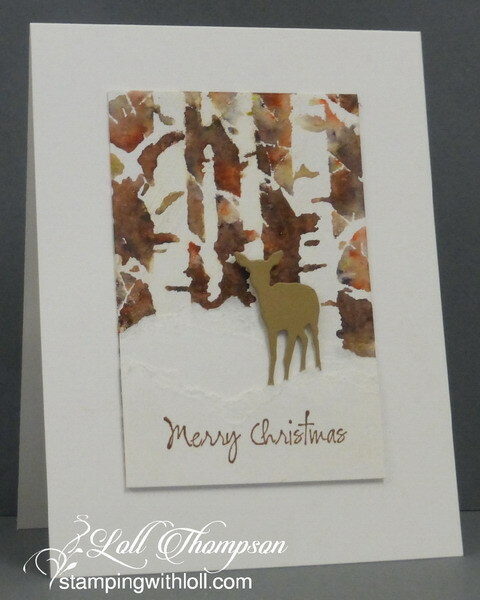 i just love these cards you have been making with the brushos and the deer - have the brushos - just might have to get those deer!! More gorgeous cards for that Christmas stash! I love that background and the white birches are so pretty against it! Wow do I love that color! Just experimented today with the black thanks to your tip! Love the reds in this! I love how you achieve clear images with wet media and a stencil! Wowsers! This is just splendid. Who would ever guess those black crystals could create this yummy textured background for these trees? Absolutely fab snow that your deer is standing in too. Must try this. What inspiration indeed! TFS & Happy wkend. (Nancy has it well dais about the clear images in the wet....it's very crisp and detailed). These are gorgeous Loll - a lesson in what a difference colour can make. This really caught my eye in the playground. I went to see the black version expecting silhouettes and was blown away, must try black on its own! These are just as beautiful. You could enter them at Mo's Rudolph day challenge. Utterly fabulous Loll! I'm stunned at how you work with your Brushos and always get such gorgeous results. This is just as gorgeous the second time around, Loll! My goodness...these two are gorgeous. The brusho work is stunning and looks like such depth of colour behind those birch trees. Be still my heart. More of your Brusho wonder-working. These are scrumptious. Wow, lovely earthy colours Loll, the cards are brilliant. 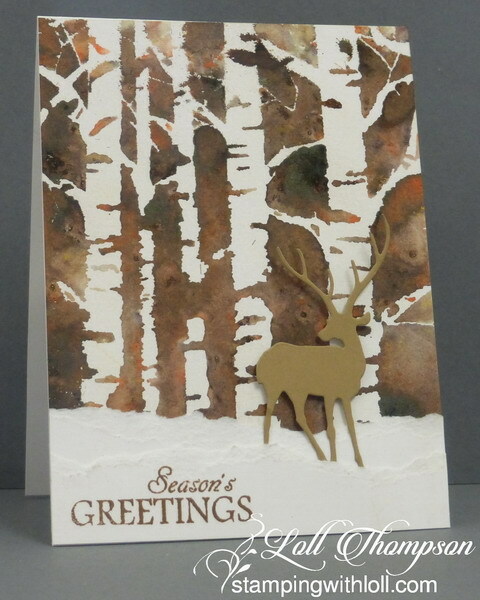 Two gorgeous cards, I love the background the trees are wonderful. Beautiful work!! Love the background you have created! Thank you for sharing with us at the Rudolph days challenge.